Waiting on your partner in crime to return? These clever, intense, and sometimes silly prison break movies are just what you need. 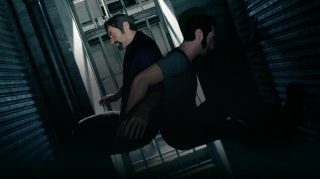 In A Way Out, you aren’t going anywhere without your partner in crime – its unique, exclusively co-op gameplay means you and a friend will have to work together every step of the way to break out of a high-security prison. So, what happens when your pal has to walk the dog, or go pick up dinner, or run from the actual police? You can keep yourself warmed up and ready for crime with some awesome prison break movies! They’ll keep your mind sharp, and who knows – you might feel inspired to play differently. Check out our Top 5 prison break picks below. Based on real-life events (but with way more Americans), The Great Escape is about an industrious group of POWs who band together to tunnel their way out of a WWII prison camp. Each of the main characters has a unique talent that makes them pivotal to the mission – like Leo and Vincent, their unique views of the world change the way their mission plays out. Keep your eyes on this one and study up on whether brains or brawn works best. In A Way Out, breaking out of prison is the easy part. It’s the planning that’s the biggest challenge of all, and re-planning on the fly when everything goes wrong. Vincent and Leo may have gotten a few lessons in strategy from Escape from Alcatraz, where Frank Morris (Clint Eastwood) and his accomplices spend the majority of its 112-minute run planning an escape that’s just crazy enough to work. Then when things inevitably don’t go quite right, they have to think on their feet to make it out in one piece – just like you do. Sometimes business on the outside won’t wait until you’ve served your time. In A Way Out, it’s revenge that sets Vincent and Leo on the path to escape, because they can’t let the man who landed them behind bars get away with what he’s done. In O Brother, Where Art Thou? by the Cohen Brothers, the main characters are after a treasure hidden in a field that’s about to be flooded. The key to both is that they don’t have a prayer unless they work as a team. The boys in O Brother have to be chained together to learn that lesson, but you know better. Escape from New York fits into the prison genre as well as a rhino covered in machine guns fits in at a dog park. But, still, if you like one there’s something you’re bound to like about the other. In this case, A Way Out’s approach to a prison break story contains its share of high-speed car chases, motorcycle jumps, and at least one high-octane rowboat ride. If you like that, then Escape from New York’s word of massive arsenals, landmines, micro-explosives, and sweet eye patches will be right up your alley. A Way Out and Stir Crazy both have one very important lesson for you: you can overcome anything with a friend at your side. Sure, the case of mistaken-chicken-mascot-identity that lands Skip Donahue (Gene Wilder) and Harry Monroe (Richard Pryor) in jail is more comedic than what put Leo and Vincent in adjacent cells. But A Way Out has its share of goofy antics (just look at the [silly mini-games] you can play together) that make Leo and Vincent’s relationship stronger. If you’re looking for a tale of friendship while you wait for your pal to return, you can’t go wrong with an excellent buddy-breakout-comedy. You’ve got a plan, now get ready to bust out – A Way Out is available now on PlayStation 4, Xbox One, and Origin for PC. Check us out on Facebook, and Instagram.